When Ken Rossi takes on a pinball machine, he’s not interested in showing off. While some arcade experts like to demonstrate how they can use a machine’s flippers to send the silver ball anywhere on the table, setting off bells, whistles and flashing lights in a flashy display, Rossi concentrates on racking up the most points he can as fast as he can. Rossi, 40, is a competitive pinball player. He won the state pinball championship last year. But more than that, Rossi leads a secret double life. As the founder of the South Jersey Pinball League, he is the East Coast’s most passionate pinball advocate. The mild-mannered Somers Point resident hosts one of the biggest tournaments in the state, Pinsanity, at his home. He also owns Evolve Studios, a graphic design and web development company, and creates his own popular posters for the tournament. Pinsanity posters sell out quickly and have been purchased by fans in France, Australia and other countries. The tournament itself is much the same. Rossi has been playing pinball since he was a high school student in Pennsylvania who spent his summers in southern New Jersey. He remembers playing pinball with one of his buddies in the 1990s at the former Aquaport Arcade on 34th Street in Ocean City. “We gravitated towards pinball for whatever reason. Everyone else played arcade games, but pinball was our thing,” Rossi said. When Rossi and his friends got a little older and had some money, they began buying pinball machines. One day in 2008, Rossi was sitting at the bar at what is now Fitzpatrick’s Deli & Steakhouse in Somers Point and saw a Theatre of Magic pinball machine. It was a game he played all the time when he was younger. He started to play it again with his childhood friend, Jamie Kelly, who also lives in Somers Point. Rossi found he had the skill to repair broken pinball machines. So he began to find bargains, buying broken games and repairing them. Currently, Rossi has a collection of 14 pinball machine in his garage. They include names familiar to pinball fans: Bally Centaur, The Lord of the Rings, Ripley’s Believe It Or Not, Spider-Man, AC/DC, Creature from the Black Lagoon in 3-D, Bram Stoker’s Dracula, Corvette, World Cup Soccer, Airborne Avenger, Special Force, Williams High Speed and Gottlieb’s Surf Champ. Tournaments now feature live feeds, so people can follow the action online, he said. And even with as much experience as he has, Rossi said he still gets stressed and can feel the nerves when he is playing competition pinball. “There is a lucky aspect to pinball,” he said. Rossi’s first Pinsanity tournament was held in 2012. The idea was to make it an event, and that’s where the posters came in. T-shirts and hats soon followed. “When you get to the home arena, not everybody is a graphic designer. Not everybody is a computer guy. So I’m like ‘I can use my graphic design thing and make it, so it’s like, oh cool. I will buy a poster, or hat,'” Rossi said. Rossi’s garage tournament has been joined by another Atlantic County tournament in Galloway Township to form a two-day event. Pinsomnia starts at 8 p.m. May 20 and lasts until 2 a.m. Pinsanity will be held on May 21. Russell Myers, 47, of Linwood, has known Rossi for five years and has been into pinball for at least 10 years. They met through the online pinball community. He, Rossi and Mark Levine of Galloway Township are three of the biggest pinball enthusiasts in the area, he said. Certain areas of the country are known for pinball: California, the Chicago area (where most of the pinball manufacturers are located) and the tri-state area of New York, Pennsylvania and New Jersey, Myers said. 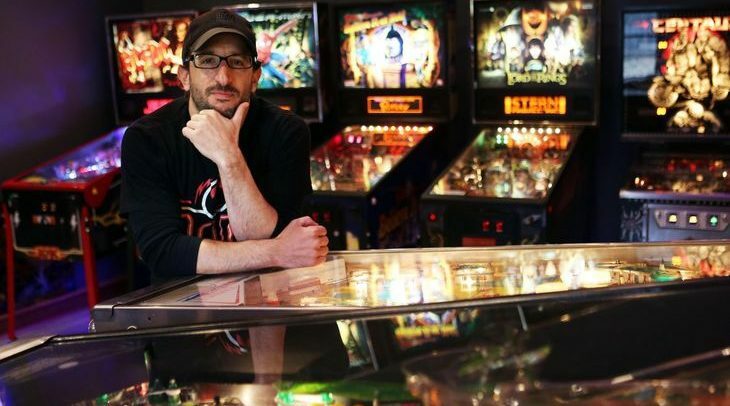 “Pinball is an entirely American phenomenon,” said Myers. During the 1930s and 1940s, it was considered a form of gambling. He said one of the advantages pinball has over video games is that the game can change. Every time you play a video game such as Pac-Man, the game is the same. But pinball has more variables. “Pinball is an analog machine. You can physically nudge the cabinet and hit the flippers. Every single game is different,” Myers said.